Kanban, Scrum, XP, DevOps; you've heard the buzzwords but what do they mean and how can they help you deliver valuable products for your customers? Try one of our classes or customized workshops to help demystify agile and help you set a course towards business agility. We've created a comprehensive set of classes and packages that cover the Fundamentals of Agile, Agile Project Management, Agile Enterprise with Scaled Framework, and many others. We also have a class geared to teaching you how best to train and coach others, using techniques from Sharon Bowman's 'Training from the back of the room'. If you are interested in learning more about Agile and Lean combined strategies and methodologies, check out our Á la Carte workshops, they are hands-on skill development exercises and simulation games you will enjoy! 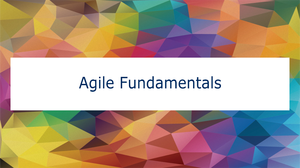 This course focuses on the agile mindset, the values and principles that are foundational to give you a core understanding of what is needed to adopt and be ‘agile’. It covers how all frameworks manifest the values and principles of agile. This course will help you learn the skills, techniques and mindset needed to orchestrate a team effort, collaborate with stakeholders, and support self-organizing teams in continuously adjusting and refining their efforts to increase efficiency and effectiveness. In this two-day course, you will gain the knowledge necessary to lead an enterprise agile transformation by leveraging the Scaled Agile Framework® (SAFe™) and its underlying principles of lean thinking, and product development flow. How often does your team struggle with conflict? Disillusionment? Outright disinterest? You need a facilitator's toolkit to reengage a team, to build consensus and to create accountability. In this two-day course you will practice the techniques and concepts of professional agile facilitation. Discover how the human brain really learns. Experience and absorb the principles and techniques for effective learning, so different from a traditional training approach. Modernize your approach to training based on the most current “Cognitive Neuroscience” for effective instruction. We have developed custom onsite workshops tailored to the unique needs of your business or mission. Workshops in easy-to-digest formats from two hours to one day. They cover a wide variety of topics from technical concepts to leadership skills for a variety of diverse audiences at all levels of your organization. We focus on hands-on skill development through exercises or simulation games. Some are used to kick-off projects, while others assist ongoing efforts.